Discounting on the room type’s availability. Discounting on the number of booked nights. Last but not least, in addition to Solidres 0.8.0 version, there will be a lot of updates for our modules/plugins/templates. Exciting months ahead, please check out blog regularly for latest news or subscribe to our mailing list to get major updates via email. 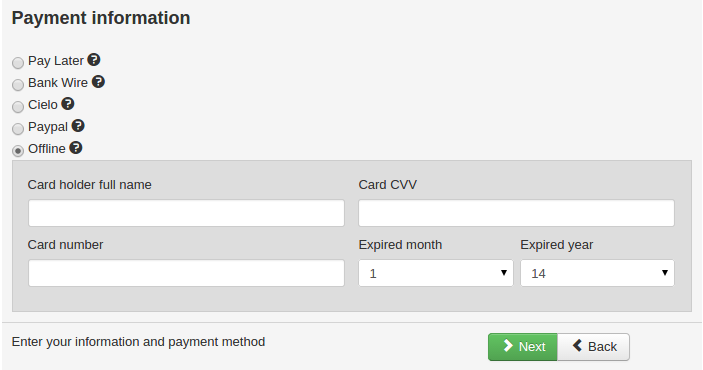 We’d like to show the first preview of our upcoming Offline credit card payment plugin. This plugin is useful when you only want to collect credit card info (not process/capture it) and store it for manual processing later. This new plugin will be compatible with our upcoming 0.8.0 release. Default currency in Solidres configuration is not saved correctly. Orphan Falang translation for Standard tariffs. Add 0 as default values for Standard Tariff when creating new room type. Could not select asset via modal window in some cases. Room quantity validation only applied to cancel event. Download 0.7.2 and install using Joomla Extension Installer, it will automatically update your current version. Or you can update using the built-in Joomla Updater.